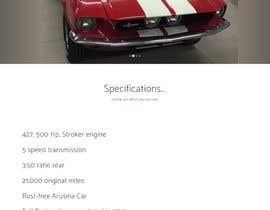 We are US based nonprofit ( [login to view URL] ) hosting online charity raffle featuring a 1967 Shelby Mustang Fastback as the raffle prize to support the US Veterans and Disabled Military Men. We currently have a website ( [login to view URL] ) which you must visit to get the idea about the raffle and how we are campaigning online for fundraising. We need an additional landing page designed + coded in Responsive HTML PHP with a one page parralax layout featuring all the pictures and features of the car and the Charity Motive with appropriate information and a beautiful ticket selection area. Please visit [login to view URL] and study all the sections on the home page and come up with a brilliant idea and design. We have already booked the domain [login to view URL] for this landing page. The site should also on the top contain a nice countdown timer maybe overlaying the fullscreen slider of the car pictures or something to show the remaining days:hours:seconds. The landing page should be good with SEO and responsive. You first have to just submit the image design of the website to win the content. The winner then shall move forward and complete the coding within 24 hours. Please come up with best of your creativity for this noble cause. If everything goes well we will also look forward to hire you for another project and renovate our nationalautoraffle website. If you have any more questions or need more details, please feel free to post on the public clarification board and i'll bee happy to chat with you and provide you with everything you require. I am joining this contest. I see that your website nationalautoraffle.com is running on WordPress. So do you need the new website for 1967shelbymustangraffle.com as a WordPress website or just HTML/CSS site is enough? We will be hosting it as simple html css for a basic landing page. The ticket selections then will be linked to our shopping cart on the nationalautoraffle site. Yes. HTML/CSS codes will be enough provided it is responsive, well coded and with good CSS3 animations on the elements. i have read your description and i am interested in your project. Thank you for your interest. Kindly read through the description and post your entry.